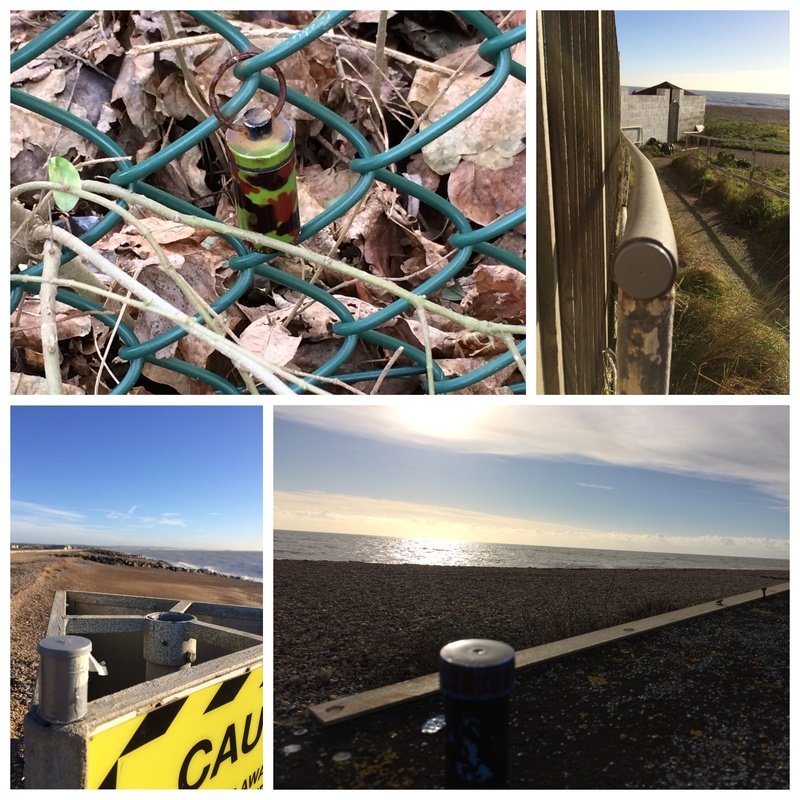 Last December, we visited Worthing and managed to find quite a few caches along the shoreline from Ferring to just before Worthing Pier where we spotted The Burlington Hotel which beckoned with the most amazing lunch. As mentioned in my earlier blog, South Coast, we were quite impressed with this hotel and as a surprise for Cockrobbinn, I booked a couple of nights stay for over his birthday which happened to be on 12th January; the idea being that we would try and find all the caches from Ferring through to Shoreham beach along the promenade. After the disappointment in the quality of the last place we stayed in, I was hoping that this refurbished Victorian hotel would be a pleasant change, and I wasn’t mistaken. Although a little tired in places (as all Victorian hotels tend to be) our room was absolutely enormous with every luxury you could imagine; not just soaps, shower gels, shampoos, bath cremes, shower caps but tooth cleaning ‘kits’, shaving kits, snowy white towels, masses of coffee sachets, hot chocolate sachets, various teas (flavoured and plain) and bottles and bottles of water replaced free of charge every morning. We had been upgraded to a family room as I had requested (if possible) a room with a sea view and we weren’t disappointed. You can just see my little car (bottom left hand corner) in the hotel’s parking bay. It didn’t move all the time we were there as just over the hedge from the car is the promenade where the majority of caches were to be found. We had already found most of the caches to the west – heading towards Ferring, so we turned East and started our search. It was quite late in the afternoon by the time we had settled into our room, had lunched rather superbly and then suitably dressed and booted we walked out of our hotel and turned Eastwards towards our first cache of the day which was to be Daylight Shrubbery GC2474A. It was freezing cold, blowy but lovely and dry and perfect for our stroll along the prom. We soon found Boarding, Simon Says ….Sit, Splashpoint 2 and Rest Up – all hidden exactly where suggested and the GPS was working great. We had a little bit of excitement at Splashpoint 2. The cache was located at the side of a building on the seafront and we soon found it, but on returning to the promenade (only a few steps) we spotted two almost naked men leaning over the balcony of the building which we believe was a fitness centre/sauna. The balcony was just above head-height so, dare I say, we had a good view but in that weather there wasn’t much to see !!!! As it was starting to get even colder we decided to head back towards our hotel and attempt the cache hidden on Worthing Pier called Walking on Water GC5N4NT. As Cockrobbinn would say, it was blowing a hoolie so we were grateful for the glass partitions running all the way down the pier and we were careful to stay on the east side to avoid most of the wind. It was a glorious late afternoon but we soon realized that the cache was to be found on the westward side so we rounded the end of the pier and hit the full force of the wind. Amazingly, the GPS took us straight to GZ and we spotted the little blighter quite quickly. Now we can understand why it was named ‘Walking on Water’ as the view below was quite tummy churning! Being extremely careful not to let the log disappear in the wind, we signed it and quickly hid it again before venturing into the South Pavilion for a spot of afternoon tea. 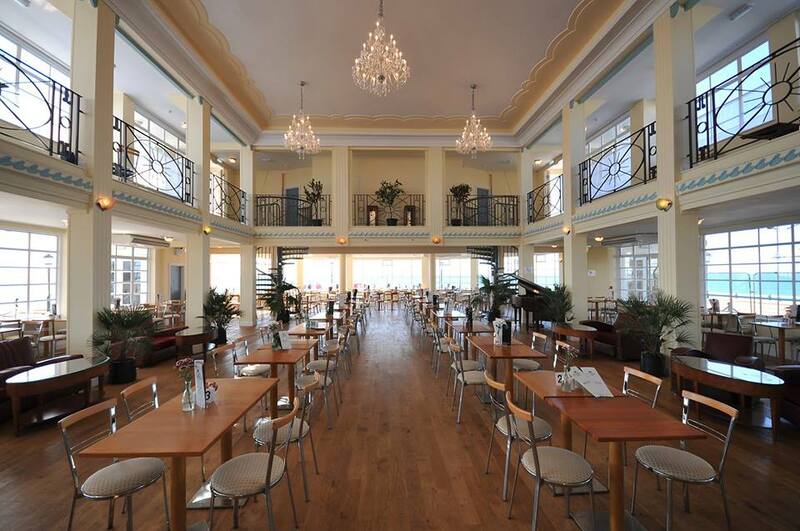 Anyone visiting Worthing really must visit the South Pavilion; built in 1935 this Art Deco pavilion has been completely refurbished and has the most amazing views of the south coast. Sitting in a comfy armchair with a pot of tea and listening to someone playing the piano is pure indulgence. Out of season, December and January when we visited, there very few people and we almost had the place to ourselves. I think the tea must have revived us as rather than returning to our hotel, which was on the promenade, we decided to head up the side streets to find a couple more caches. There was method in my madness as I realized we were only 4 caches away from reaching the magical 500 figure and being this close, I really wanted to crack on. 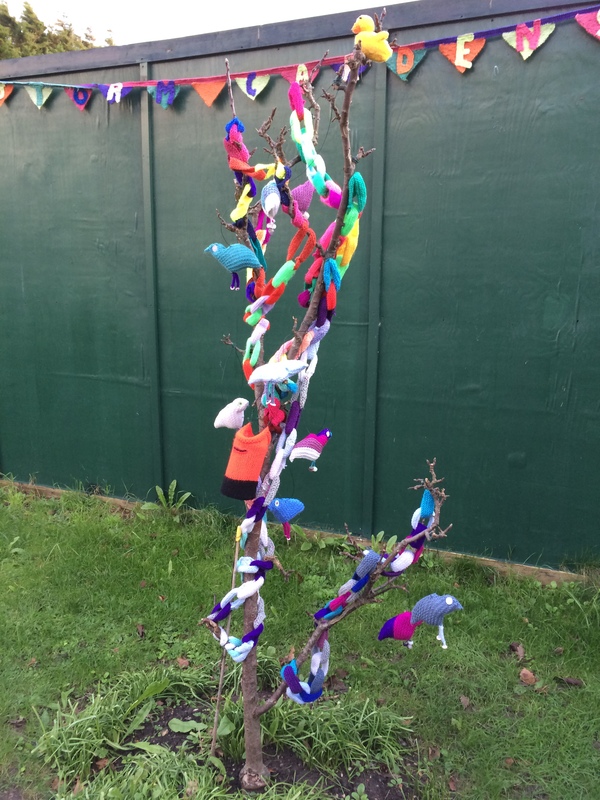 Complete with knitted post covers, trees decorated, walls painted, this little area had been transformed. It took us quite a while to find the cache but eventually Cockrobbinn proudly produced it from where I had already looked! Determined now to reach our 500th cache, we soon came across Church Micro #1699 Worthing Tabernacle GC2Q25T and again Cockrobbinn was the first to find, leaving me trudging after him. Now for our 500th find. Another Church Micro this time #990 Christ Church, Worthing GC23K5D was the resting place of our 500th cache – nicknamed Humphrey as that was the clue. It was an easy find and we gave it a favourite point as it was such a lovely church for our celebratory cache. 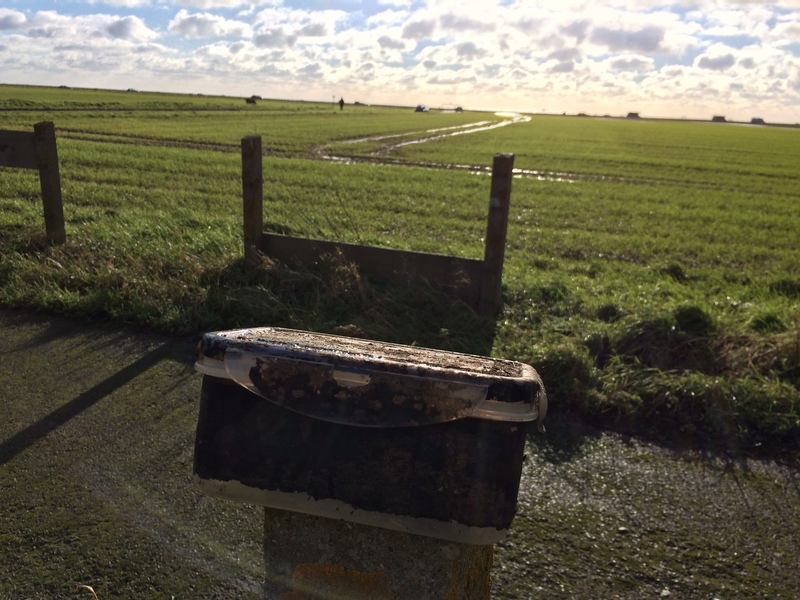 We strolled back to our hotel along little roads we would never had seen had we not started geocaching back in August 2014; very pleased with ourselves and looking forward to the following day when we hoped to complete the caches all the way to Shoreham beach. It’s strange how things happen but I suppose we were on a roll. After a rather filling dinner at The Burlington, we sat musing over coffee when I suggested what a good idea it would be to wrap up well and enjoy a short walk to help our dinner settle. Amazingly, Cockrobbinn agreed so we ran upstairs (no lifts), wrapped up VERY warmly and headed out into the night. It was actually a lovely night – cold but not too much wind and the stars were out. 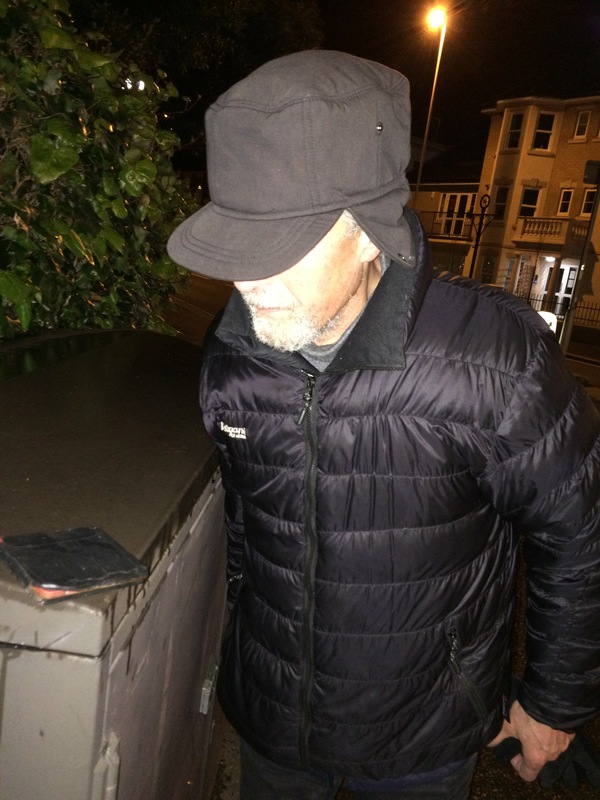 Of course, it wasn’t just a walk around the block – there was a geocache just a short walk away !!!! Would you trust this man in the dark? Thankfully, Go West …..to the End GC5HF87 was at a well-lit crossroads, albeit down the back streets of Worthing. The signal was jumping all over the place and was putting the cache in the middle of the crossroads but we soon found it and signed the log. Our very first night-time cache and unbelievably – our torch didn’t work. Thankfully my iPhone has a flashlight on it. Just one more, just one more I pleaded with Cockrobbinn who soon gave in and off we went in search of Dame Vera Lynn GC5HFHD. This time, I’m sure we looked really suspicious as Cockrobbinn ended up climbing on a wall, in among shrubbery, to retrieve the magnetic nano at the top of a sign. After this, he insisted we went back to the hotel and safety. The next day dawned really bright and beautiful with an amazingly clear blue sky but deceivingly cold. Cockrobbinn and I had decided to take a taxi to the furthest cache on Shoreham beach and work backwards towards the pier, or rather the last cache we had found along the promenade. The hotel had a taxi for us within a couple of minutes and we managed to get the driver totally interested in Geocaching on the drive to Shoreham; he even wrote the name down so he could look it up when he finished his shift. He was also quite concerned in that we were going to walk all the way back to the hotel but to be fair, it was only about 8 or 9 km which isn’t really very far for seasoned Geocachers that we are …..haha. I won’t bore you with listing all the caches but we started with Bench GC2G4PG and worked our way along the promenade with one small sortie into a park where we found two extra caches, and managed to pick up 25 caches before reaching Sleepers GC5F8TR which was the one we needed nearest our hotel. Footsore, but delighted with our result. 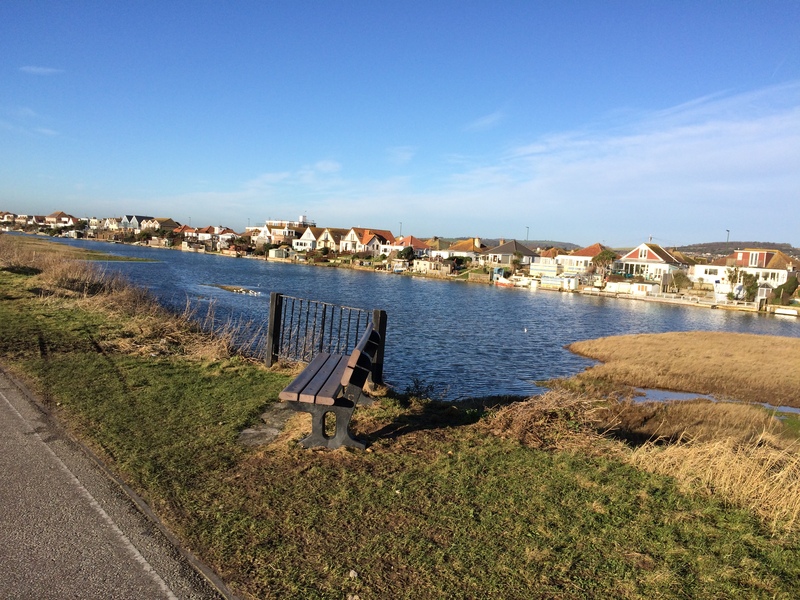 The route from Shoreham towards Worthing passes Widewater Lagoon which is really beautiful. The path is very popular with dog-walkers and we noticed that even the dogs were suitably coated with little pink jackets and tartan wraps. It really was quite chilly. Two-thirds of the way along, we stopped at a lovely beachfront café and sat outside in the sunshine sipping our coffee/hot chocolate. I cannot believe how warm it was when sheltered, for mid-January and we were lucky in that the wind had died down for the time being. 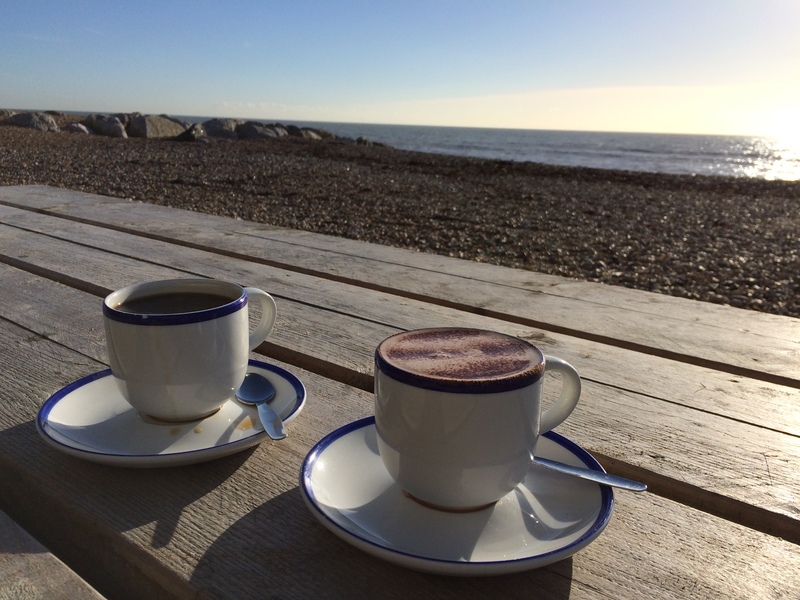 There is something very special about sitting drinking a hot chocolate on the beach in the middle of winter. 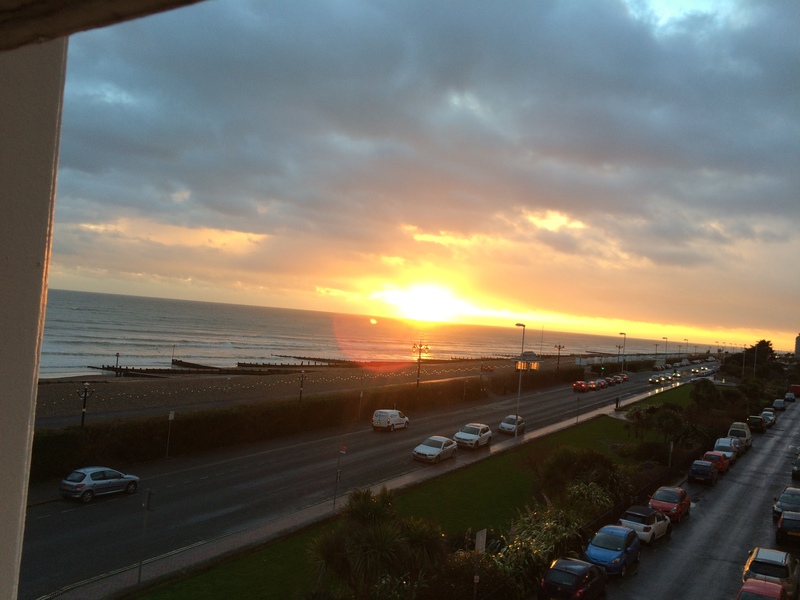 The following day, we sadly checked out of our hotel and made our way to Ferring. When we had started this row of caches back in December we had missed the first four and we wanted to find them so that we would have a complete row of smilies along the shoreline. Again, it was a beautiful day but VERY cold and VERY breezy but wrapped up warm we managed to find Ice Cream Van View GC57R99, and Eleanor and Leo’s Cache GCK30C (which really does need some maintenance). 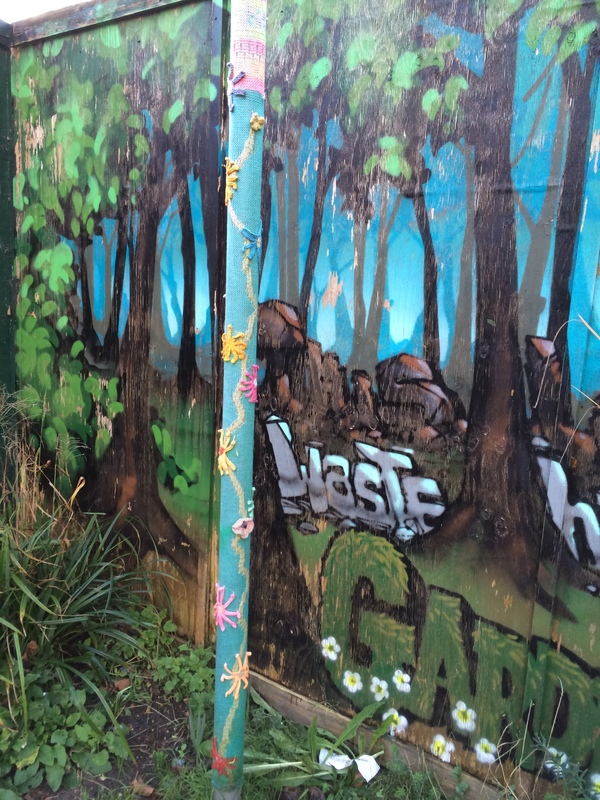 Horror of horrors – we couldn’t find the next cache 50/50 or PAF GC57Z3V. We found where it should have been (it had been found a few days previously) but we believe it had probably slipped down out of sight so we had to leave a DNF and made a note to contact the CO. Our disappointment was enormous but we carried on and found the final cache of the stretch of beach – What a Lifesaver! GC57Z3P Another fantastic beach cafe found and after being suitably refreshed we added two more caches to our belt on the walk back to the car. Overall, a very good morning. 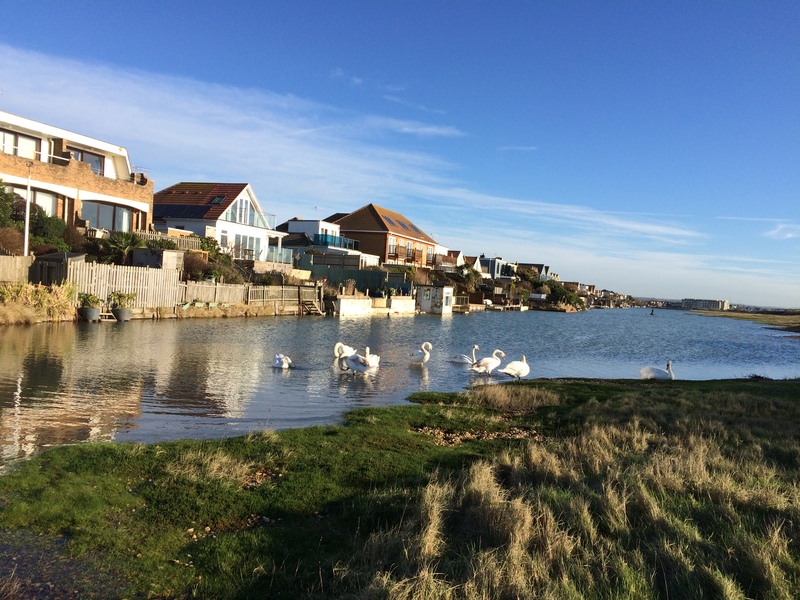 Time to head home, but whilst we were away we spotted the D2D Ring – just inland from Shoreham, which is a circular walk of approximately 8.5 miles and consists of 48 caches and takes you on walk along the Adur River and up across the South Downs. I think this one may well be on a list of to-do’s the next time we decide to head down South. This outing took place on 12th, 13th and 14th January 2016. The sun gods were really kind to us as we had beautiful blue skies for most of the time. 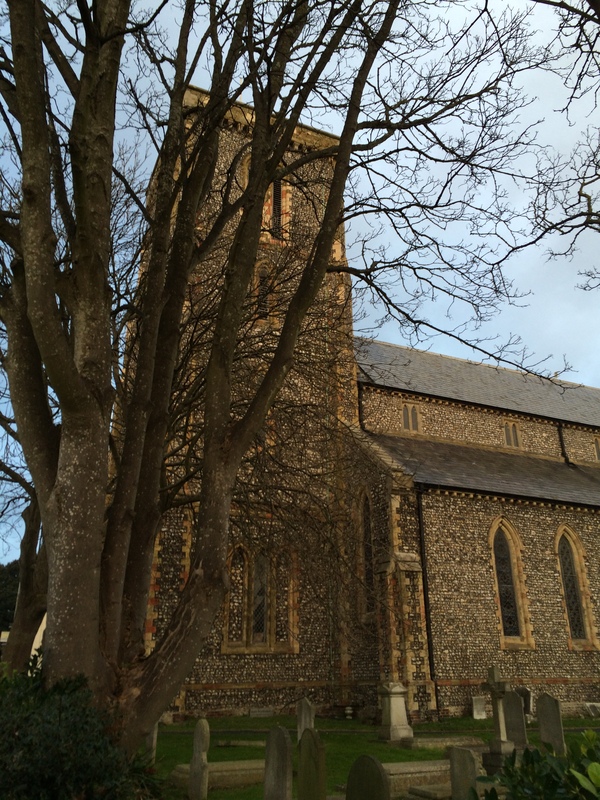 This entry was posted in Caching, Church Micro, Geocaching, The Burlington, Worthing and tagged Caching, Ferring, Geocaching, GPS, Log Book, Pier, Shoreham, Smilies, Worthing. Bookmark the permalink. Looks like you had a great time caching in Worthing. 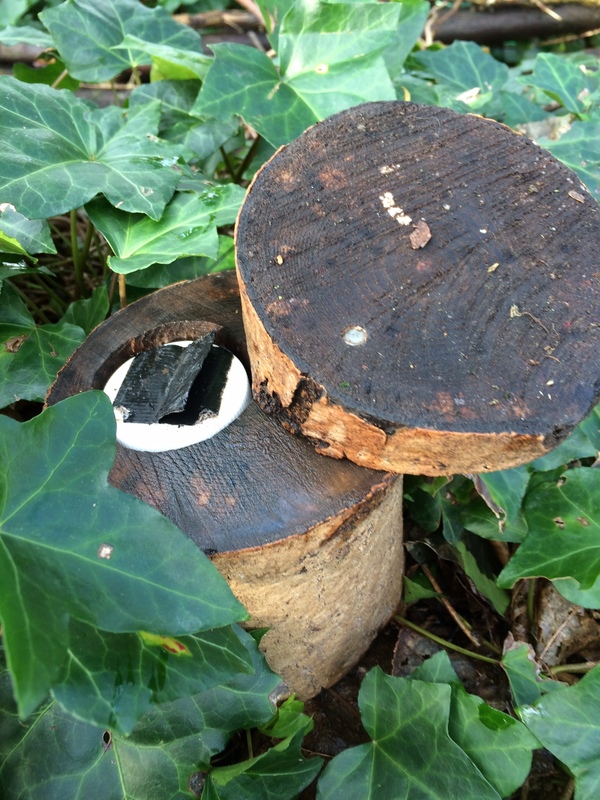 So many caches there – you did well to find them all (bar one!). Really lucky with the weather, we imagine a really wet and windy day and the promenade wouldn’t have been so inviting. Cold and wind I can put up with (well wrapped of course) but rain would have seen me staying put in the hotel! That promenade and pier would have been very bleak in the rain. We’ve been very lucky with our few trips away geocaching.